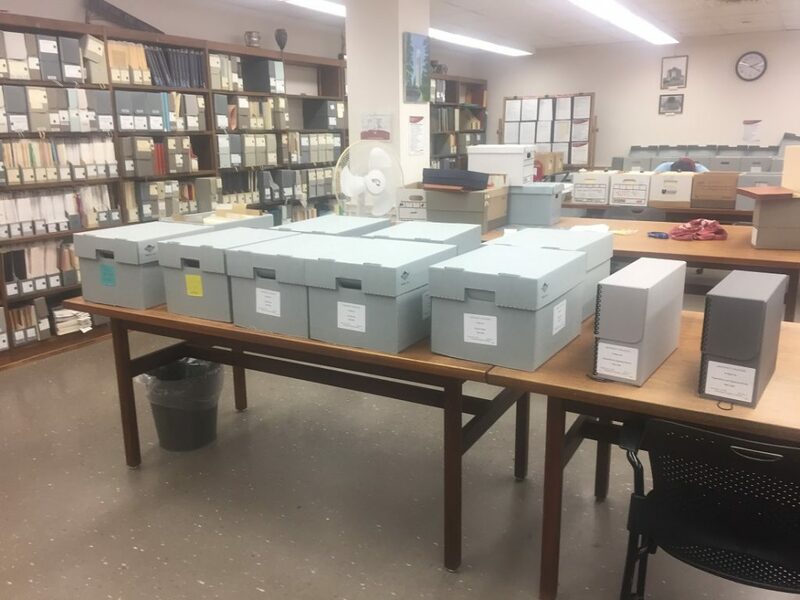 During the summer of 2018 I’ve had the opportunity to work in the University Archives at Spencer Research Library as part of a Museum Studies student internship. Since my emphasis is in archival work, my projects throughout the summer covered a variety of related archives topics. 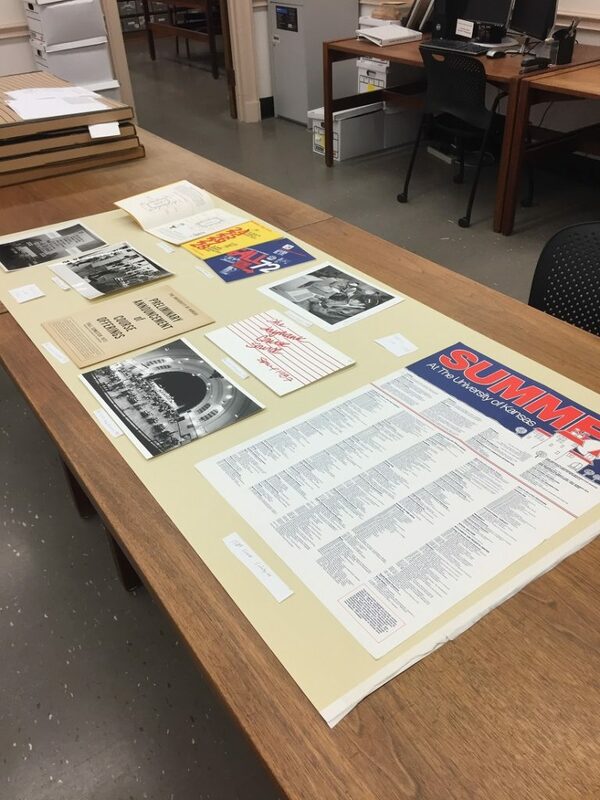 Since I was initially hired on as a research assistant for a special project on the Jayhawk, I’ve mostly been working with primary source documents concerning the history of the school and the mascot. 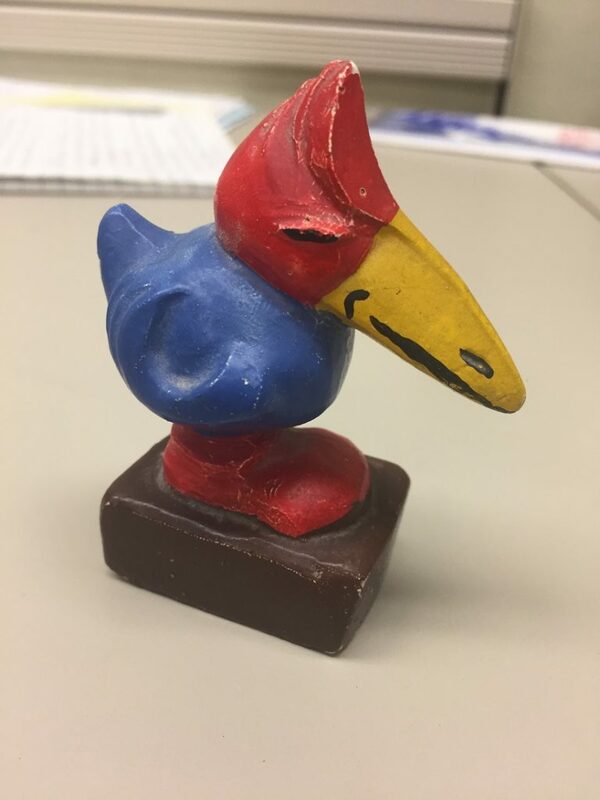 A Jayhawk artifact in University Archives. Click image to enlarge. While that project is ongoing, with still many image files to be organized, my internship projects have acted as a general introduction to the functions of the University Archives. I had the opportunity to learn about processing of new materials by working with some new arrivals from the Pi Beta Phi sorority. These materials ranged in date from the formation of the chapter in 1873 to the mid-1970s — over a century of history. Processing involved creating new file boxes to hold scrapbooks, club minutes, chapter histories, signature books, and expenditure records. Other unique documents included calendars, songbooks, programs, membership cards, letters, pledge books, sorority newsletters, and photographs. The much-anticipated opportunity to handle the photographs also introduced me to the process of inter-filing. 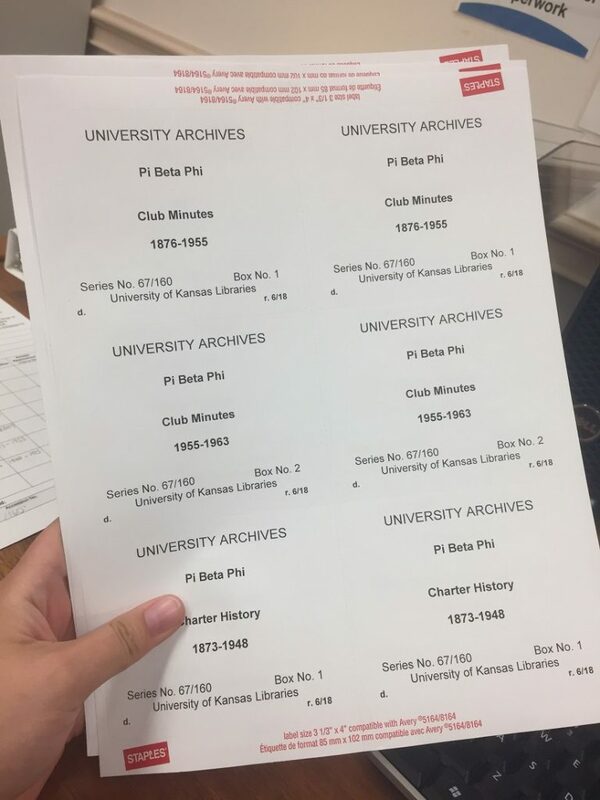 Pi Beta Phi records in University Archives. Click image to enlarge. Labels for Pi Beta Phi records in University Archives. 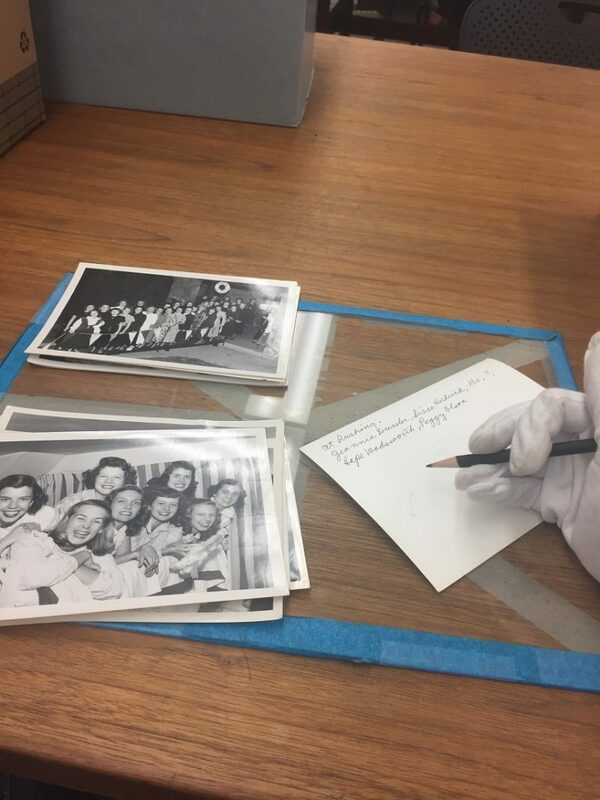 Processing Pi Beta Phi photographs in University Archives. The other major project that I was assigned this summer was to create an exhibit to be displayed at Spencer during the month of August. 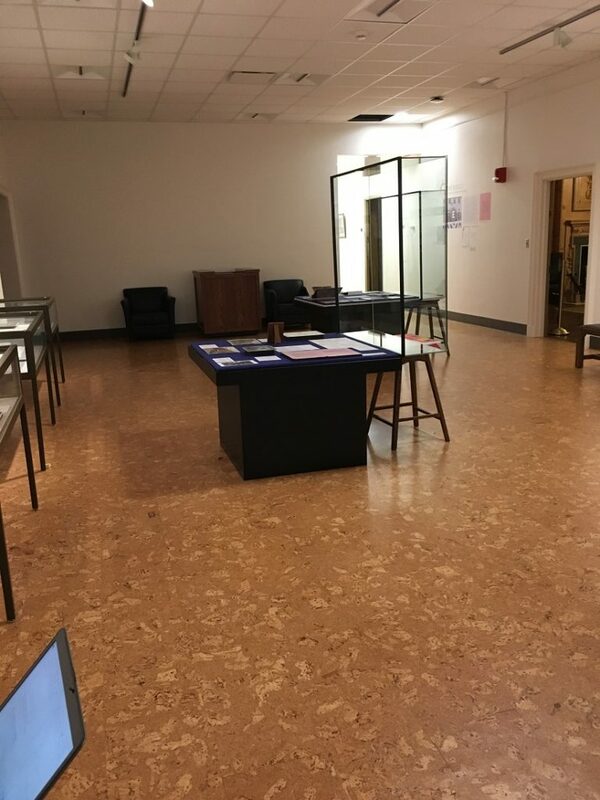 The exhibit would incorporate materials from the Archives and would discuss an aspect of KU history. The topic that I finally decided to use was enrollment — specifically, enrollment before the time of computers. It was a fascinating subject to research, personally having only known a time of computerized college enrollment. It’s easy to forget that the process once had to be done in person, utilizing multiple buildings and a complicated system of codes, cards, and queues. The exhibit will feature various documents related to the enrollment process, covering five decades. My intention is to inform visitors on the evolution of enrollment and registration up to the obsolescence of the punch-card method. I think most of the intrigue will come from that element of obsolescence and the campus-wide chaos that would often ensue every semester. 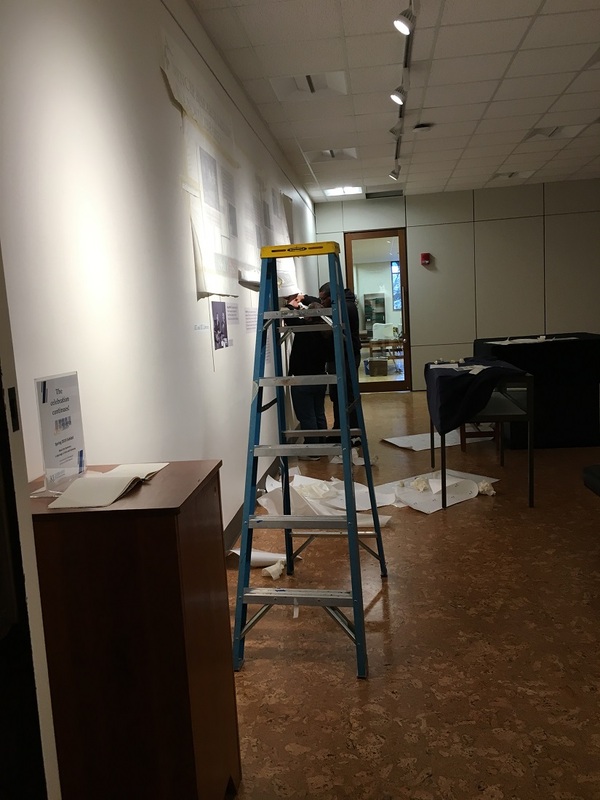 Developing a temporary exhibit for University Archives. Additionally, I’ve enjoyed the opportunity to interview and work alongside many wonderful staff members at Spencer Research Library. I want to thank Becky Schulte, Letha Johnson, Whitney Baker, Caitlin Klepper, Meredith Huff, and Marcella Huggard for allowing me speak to them about their positions, responsibilities, and functions within the library. This is the twelfth installment in what will be a recurring series of posts introducing readers to the staff of Kenneth Spencer Research Library. 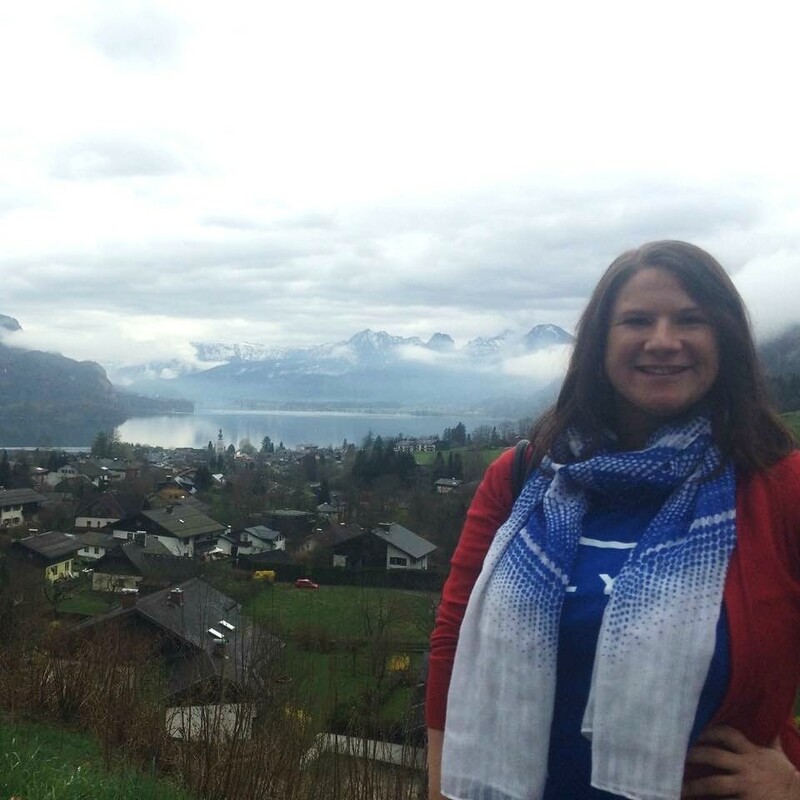 Joining us in October 2017, Stacey Wiens is Spencer’s newest team member; she’s the Reference Specialist in Public Services. I moved to Kansas from California (the state where I was born), but I have also lived in Texas, Colorado, and Missouri. What does your job at Spencer entail? My job is about helping users of the library to access the materials and find the resources that best meet their needs. I am still in the training phase for my position, but I will eventually assist researchers in person at the Spencer Reading Room and also respond to off-site researchers through email and phone. How did you come to work at Spencer Research Library? I am coming to the library field as a second career after having been a teacher for several years. I graduated with my master’s in library science in May 2017. 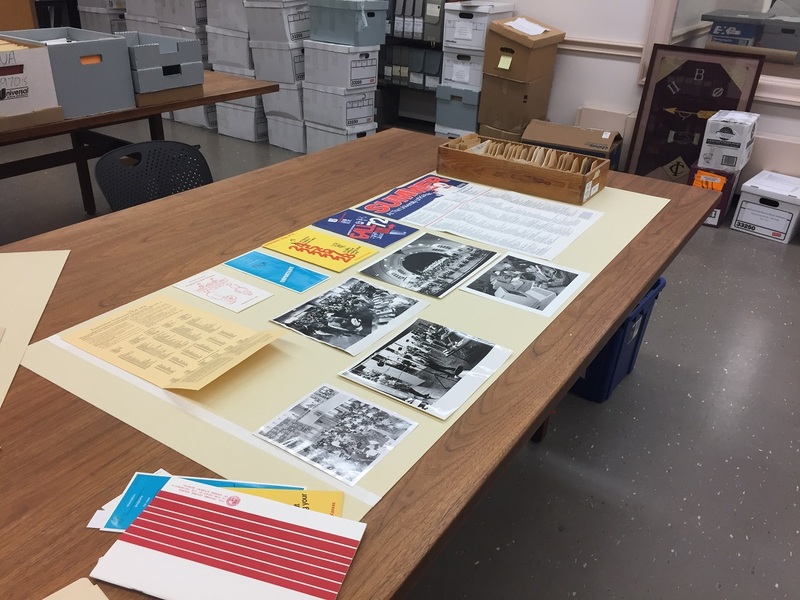 While I was in the MLS program, I found that I was drawn to the issues related to special collections and archives such as how to provide access but also protect these materials over time. I completed a graduate certificate in archival management along with my master’s degree. While in graduate school, I was working as a librarian at a public library in California and lived in an area where opportunities to work in archival institutions are limited. 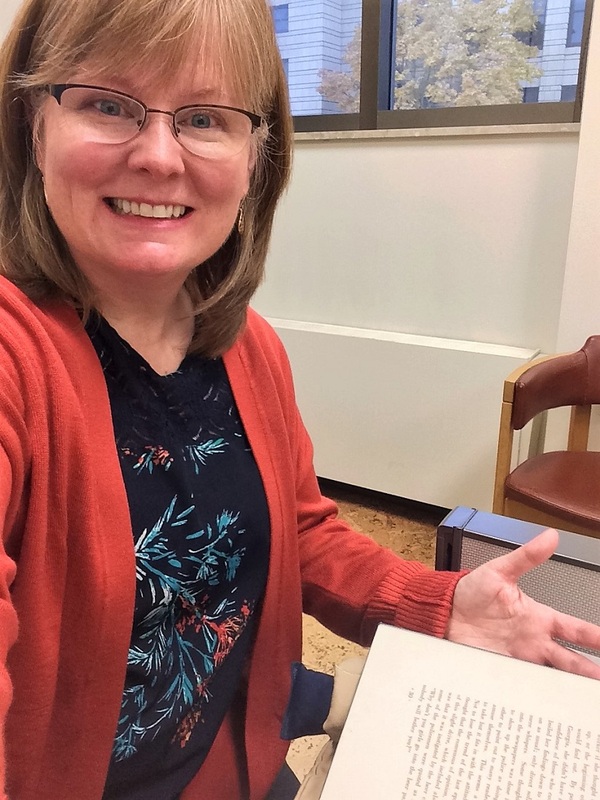 When I had the chance to apply for the Reference Specialist position at Spencer Research Library, I saw it as opportunity to apply my past experience as a reference librarian and educator while being exposed to work in a special collections and archives setting. What is one of the most interesting items you’ve come across in Spencer’s collections? The John Gould materials in the Ellis Ornithology Collection are a treat to view. Products from the entire lithography printing process can be examined, i.e., the beginning pencil sketches, inked and painted masters, rubbed transfer images, stone printing plates, and vibrantly-colored final prints. I highly recommend visiting the exhibit in the North Gallery of Spencer Research Library to learn more about John Gould, the artists who worked with him, and the lithography process. 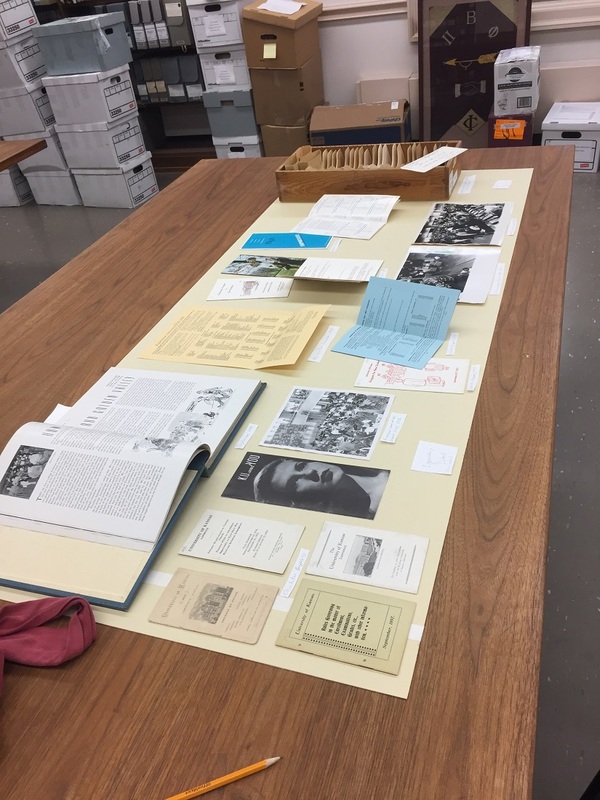 Also, check out a 2014 blog post by Special Collections Librarian Karen Cook. I saw drawings from the Kansas City Terminal Railway that are plans for building a train trestle (a supportive structure over a low place in the landscape). These drawings were from a time before calculations and schematics could be produced by computers. I was struck by the knowledge and skills that are represented by the intricately-detailed drawings with load-bearing information included for each support. While looking through some of the early KU yearbooks, I found them to be entertaining and revealing of perspectives from a particular point in time. For example, in 1884, the KU departmental classifications were listed as Science, Literature, and Art; Elementary Instruction; Law; Music; and Normal. In the 1903 yearbook, the member lists for a Bachelor’s Club and an Old Maid’s Club were included. Advertisements in yearbooks also offer insights into daily life of a particular time. In 1884, ads revealed that pianos, organs, and sewing machines were often sold in the same store. An ad from 1903 purported that purchasing granulated opium is the best choice for making tinctures. I enjoy helping researchers discover and use the tools they need to feel confident in their search processes. I like the problem-solving aspects of maintaining awareness of our resources and how best to match our resources to a research question. Watching classes of students interact with Spencer materials, especially when they can’t help but show their excitement, is another fun part of my job. What are some of your favorite pastimes outside of work? Being out in beautiful natural settings, exploring places that are new to me, creating art, playing tennis, and watching sports with my husband are some of my favorite activities when not working. What piece of advice would you offer a researcher walking into Spencer Research Library for the first time? Don’t be intimidated by the process at Spencer. Although it is a different research experience in that you don’t have access to browse the shelves of materials, the request process is fairly straightforward, and the staff is eager to assist you as needed. Allow yourself plenty of time to interact with Spencer’s rich and intriguing materials. Sometimes, using primary source documents, for example, can require some extra time to determine if the items contain what you need. It’s a great idea to acquaint yourself with the Spencer Research Library website before visiting. The Aeon system for requesting materials, the KU Libraries catalog, and Spencer finding aids are available online. Feel free to contact the Spencer Public Services staff if you have questions before you visit. We look forward to seeing you at Spencer! This is the eleventh installment in what will be a recurring series of posts introducing readers to the staff of the Kenneth Spencer Research Library. 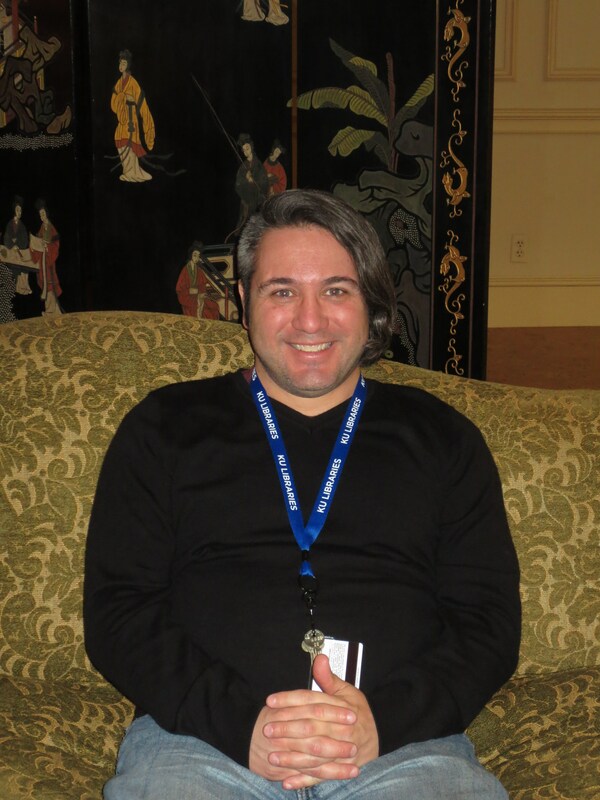 Chris Banuelos is the Audiovisual Preservation Specialist for Conservation Services at the University of Kansas Libraries. Chris relaxing in the lounge at Kenneth Spencer Research Library. I grew up in and around Greater Los Angeles, or the Southland, as they call it. I have lived in the San Gabriel Valley, OC, Inland Empire (specifically the Pomona Valley), and Gateway Cities regions. What does your job at KU Libraries and Spencer Research Library entail? Officially, I am the Audiovisual Preservation Specialist. As such, I am responsible for the care, maintenance, and potential reformatting of the A/V materials housed here within the various collections at Spencer. The care and maintenance component involves adhering to the best practices and standards for the handling and storage of the myriad A/V formats living at the library (which runs the gamut from motion picture film to tape-based material to digital files), including the machines necessary to play back the content. For a brief time, a job listing for the position had been floating around the list-serv of the graduate program I attended at NYU. On a whim I applied and through a stroke of luck, participated in a series of interviews that lead to acquiring the job. By far, my favorite part of the library is the Wilcox Collection of Contemporary Political Movements. In particular, there is a VHS tape I really want to watch called Demon U.F.O.s. Because the only thing worse than a demon OR a u.f.o. is a combination demon u.f.o. The paycheck! No, but really, having the opportunity to create an A/V infrastructure that works in tandem with the extant (and wildly successful) Conservation Department is a fantastically noble challenge. The university houses some really great content that is begging for further study and I am rather excited to be a part of its discovery. Um, and the paycheck. I don’t know that I have a pastime. I try to at least talk, if not Skype with my daughter every day. She’s eight and is absolutely hilarious. Don’t be afraid to ask for anything. Everyone that works in Spencer is extremely accommodating to patron requests and is willing to go the extra mile to obtain whatever it is that is being asked for. 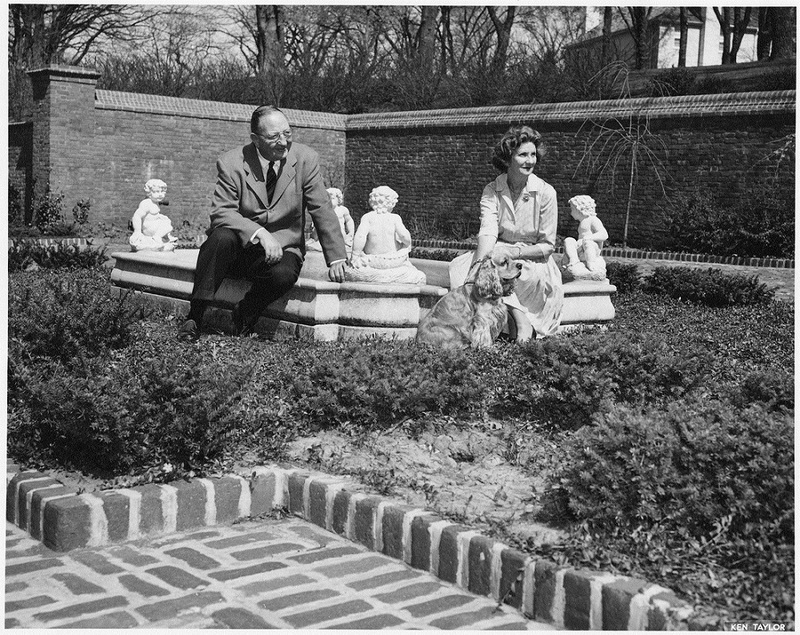 This is the ninth installment in what will be a recurring series of posts introducing readers to the staff of the Kenneth Spencer Research Library. Joining us in July 2016, Emily Beran is Spencer’s newest team member; she’s the Library Assistant for Public Services. I’m from Claflin, this little town in central Kansas. I’m primarily responsible for running reception and assisting with the day-to-day running of things at the Spencer (helping with schedule, office inventory, working with students, etc.). I’m also learning more about the collection right now so that soon I can page materials for patrons and help with research questions. I actually worked for KU Libraries for three years as an undergrad (Watson Cataloging Department). When I saw there was an opening at the Spencer for a library assistant, I knew I had to apply! Not only did the position bring me back to KU but it also gave me the opportunity to work in an environment that really prizes research and accessibility to the amazing resources available here. Narrowing this down is so hard! Right now I’m really excited about the facsimiles of The St Alban’s Psalter and The Relics of St Cuthbert that I stumbled upon just the other day! Those are at the top of my list of items to check out! Learning more about the collection! I can’t wait to explore more! I love to read – something I can do for fun again now that I’m done with my master’s. I also watch a ridiculous amount of Netlfix. Oh and I’m working on learning French! Never be afraid to ask questions! It’s the best way to learn!